Donald Trump’s victory in the 2016 presidential election surprised almost all major vote forecasters who predicted Hillary Clinton’s victory. But 10 months earlier, in January 2016, Ryuho Okawa, Global Visionary, a renowned spiritual leader, and international best-selling author, had already foreseen Trump’s victory. 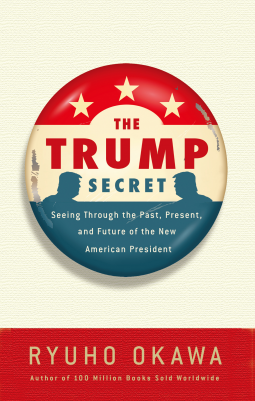 This book contains a series of lectures and interviews that unveil the secrets to Trump’s victory and makes predictions of what will happen under his presidency. This book predicts the coming of a new America that will go through a great transformation from the “red and blue states” to the United States. Chapter 1 is based on Okawa’s lecture given the day after the 2016 presidential election. It forecasts what will happen as a result of Trump’s victory, including the end of the Middle East conflict, the U.S. economic strategies against China, Trump’s measures against illegal immigrants, his tax policies, and America’s future relations with Russia. Chapter 2 is based on Okawa’s public talk given in New York in October 2016. This chapter is Okawa’s empowering and encouraging message to the people of the United States of America. He calls on Americans to become aware of America’s role as the world leader once again so that we can together achieve freedom, justice, and happiness. Chapter 3 is based on an interview session recorded in September 2016. In this interview, George Washington speaks through Okawa, and answers questions on various topics, such as views on the 2016 U.S. presidential election, an evaluation of the eight years of Obama administration, and a vision of America in the 21st century. Chapter 4 unveils Donald Trump’s subconscious thoughts, or his honest feelings and intentions, about various issues including Muslim immigration, media’s criticisms against him, Chinese expansionism, and his plans to “make America great again.” Okawa’s prediction of Donald Trump’s victory in this lecture given on January 5, 2016 came true 10 months later in November 2016. ** We will book a minimum 50-City radio radio tour for “The Trump Secret.” Branch Temple Ministers throughout the United States will conduct the interviews for IRH Press from both the United States and in Japan. ** We will giveaway 5 books on the top talk station in the top 30 markets. ** We will contribute significant content to the major social media site Current Affairs. ** We will pitch book reviews, features, mentions and author pieces about “The Trump Secret” to the top 50 Current Affairs Magazines. Overall, Newman Communications will pitch over 300 newspaper, magazine, wire service and columnist in the Current Affairs. ** The United States and Canada Temples (located in New York, Los Angeles, San Francisco, Atlanta, Tampa, and Toronto) associated with the author will be engaged in their own local seminars on “The Trump Secret” and are looking for local stores to purchase the book at. In New York, Los Angeles, San Francisco, Long Angeles and San Francisco, Newman Communications will pitch local TV, Radio, Newspaper and Online media as well as local Japanese American publications to support Independent Bookstore sales.